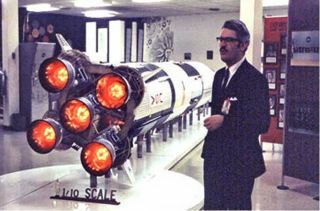 Jesco von Puttkamer, a NASA engineer instrumental in the development of the Saturn V rocket booster seen here with a model of the rocket, died Dec. 27 at 79 after a brief illness. Jesco von Puttkamer, a NASA engineer who helped launch the first astronauts to the moon, died Thursday (Dec. 27) at the age of 79 following a brief illness. Von Puttkamer joined NASA in 1962 when Wernher von Braun invited him to join his rocket team based at the Marshall Space Flight Center in Huntsville, Ala. Von Braun and his team's work led to the development of the mighty Saturn V rocket — the rocket responsible for landing the Apollo 11 astronauts on the moon in 1969. "Jesco was an institution at NASA," said William Gerstenmaier, associate administrator for Human Exploration and Operations at NASA headquarters in Washington D.C., in a statement. "His time here spanned almost the entire breadth of the agency's human spaceflight programs. He was a direct link from von Braun's efforts to get people off the ground to the International Space Station and 12 years of continuous human presence." After ending his work at Marshall in 1974, von Puttkamer moved to NASA's headquarters in Washington D.C. to work with the International Space Station team documenting the lives of the residents aboard the ISS. In addition to his contributions space science, von Puttkamer also made his mark on the world of science fiction. He served as the technical advisor for "Star Trek: The Motion Picture" in 1979, and his novelette, "The Sleeping God," was included in an anthology of work based on the series. He also penned more than a dozen books on spaceflight.